The men chatted seriously, drank black coffee, smoked cigarette after cigarette, thought of home, prayed silently. These men comprised members of the 16th Combat Team and in too short a time were to leave the comparative security of the small LCT’s (Landing Craft, Tank) and land on a Normandy beach. This was to be their first action with the enemy; this was the day for which they had trained long hard months. It was little wonder then that these men were tense, nervous, afraid.Company A, equipped with water-proofed Sherman Tanks, was to land on the beach, code-named “Omaha”, between Easy Red and Fox Green. B and C Companys, equipped with DD [duplex drive] Tanks; were to be launched from the LCT’s.The blue-green waters of the English Channel were rougher than anticipated or hoped for, rougher by far than those waters in which extensive maneuvers were held. 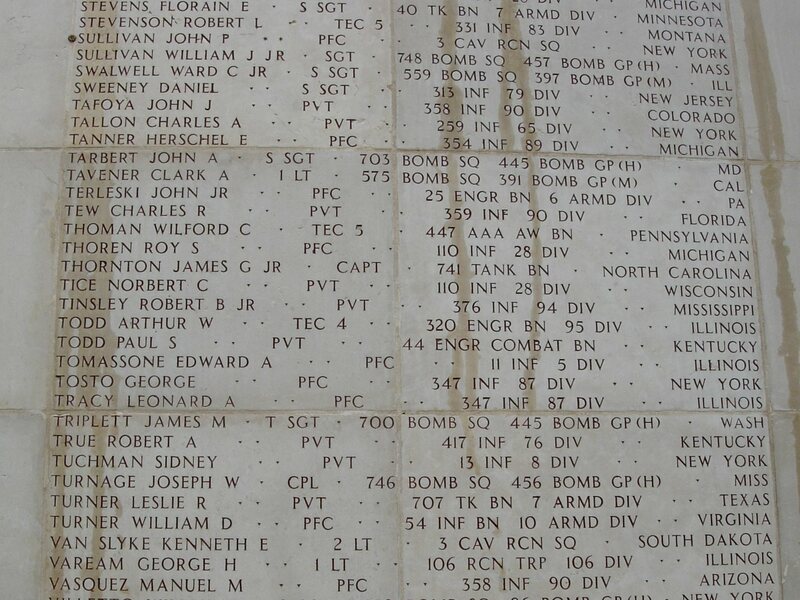 Regardless, Captains James G. Thornton and Charles R. Young, CO’s of B and C Companys respectively, made contact by radio at the appointed place and time and agreed to launch. The air was cool, but somehow stifling, and everyone made a last minute inspection of vehicles and life saving equipment.On the order, the tanks rolled gracefully into the rough sea and many of them sank almost immediately, carrying many men to watery graves. The more fortunate were able to leave their sinking tanks and swim about until rescued. Soon the Channel was a mass of bobbing heads and every available life raft was tossed into the water. Some quick thinking tank commanders anticipated sinking and in good time were able to inflate the rubber dinghy each tank carried. Not a few men were forced all the way to the bottom of the Channel before getting free and escaping to the surface. For these men, their oxygen masks were a godsend. Speedy LCI’s (Landing Craft, Infantry) did praiseworthy work, zooming about the hundreds of larger vessels, picking up men everywhere from the water, and taking them to hospital ships in the rear. “Capt. Thornton, Company Commander of B Company, was the first tank off his LCT with all, but one, tank platoons following orders, as he did, all these tanks immediately went to the bottom of the English Channel,” he wrote. Co B, on 14 September, with two platoons, attached with 2nd Battalion, 109th Inf, at 0930hrs. Their objective was the high ground 1500 yards SE of HARSPELT, the town being the line of departure. The tanks deployed on either side of the road, and engaged the enemy pillboxes. A deep ditch prevented the tanks from advancing further, but the company tank-dozer filled this obstacle and the two platoons continued on to the high ground taking the objective. All during the advance the attacking force was subjected to a heavy concentration of enemy fire. Reaching the objective, the tanks held until the infantry made it’s way up to the high ground and consolidated the position. In achieving this objective the tanks overcame ten pillboxes and destroyed two houses containing enemy troops. Throughout this entire advance Capt. 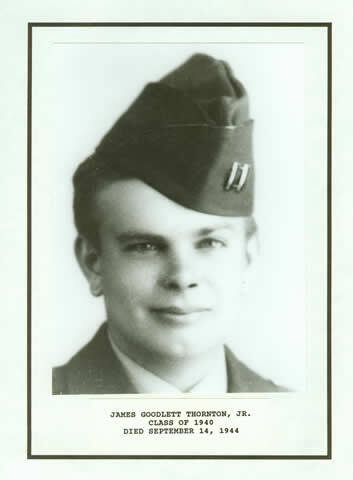 James G. Thornton, Jr. led his two platoons and directed the platoon leaders, while on the high ground in the face of heavy enemy fire. At 1600hrs Capt. Thornton and Lt. O’Shaughnessy, with the 1st platoon, were ordered by Regiment to proceed SW to join the other platoon of Co B, under command of Lt. Dudley, who was attached to the 1st Bn 109th Inf. Lt. Dudley’s platoon was, during the time, engaging the enemy, having pushed through the town of SEVENIG during the morning and aided the Infantry elements to obtain pillboxes on the high ground SE of the town. The only possible means of advance was on the road, as tanks were unable to go cross-country, due to steep, muddy hills on either side of the road. The tanks were forced to ford a stream at the outer edge of SEVENIG, as the bridge had been blown, and one tank became bogged down. The rest of the platoon continued on with Lt. Dudley. Another tank hit a mine, disabling it, and injuring two men, during the advance. Heavy firing by the tanks eventually exhausted the ammunition supply and they were forced to withdraw from the line for re-supply. After once more loading the ammunition the tanks returned to the attack at 1730hrs. On the return trip two tanks bogged down in the stream, but Lt. Dudley and one other tank continued on up the road where they were joined by Capt. Thornton and one other tank, who had fought their way through the pillboxes from the 2nd Bn sector. Two of Capt. Thornton’s tanks were hit by AT fire on this move, disabling Lt. O’Shaughnessy’s tank, and destroying the other tank, wounding one man and probably killing two other men. [next 3 lines illegible]…and only one man, the gunner, escaped. Capt. Thornton…[illegible]…are still missing in action.